A century after his July 1, 1898, charge up San Juan Hill in Cuba, the nation awarded the Medal of Honor to U.S. Army Col. Theodore “Teddy” Roosevelt. To some the award seemed overdue. To others, it was unearned. Roosevelt fought in his famous battle during the Spanish-American War, which lasted from 1898 to 1901. Although he served two terms as president, wrote 40 books, and earned the Nobel Peace Prize, Roosevelt called San Juan Hill his finest moment. He left little doubt in the minds of others that he fully expected to receive recognition. “I am entitled to the Medal of Honor and I want it,” Roosevelt said. 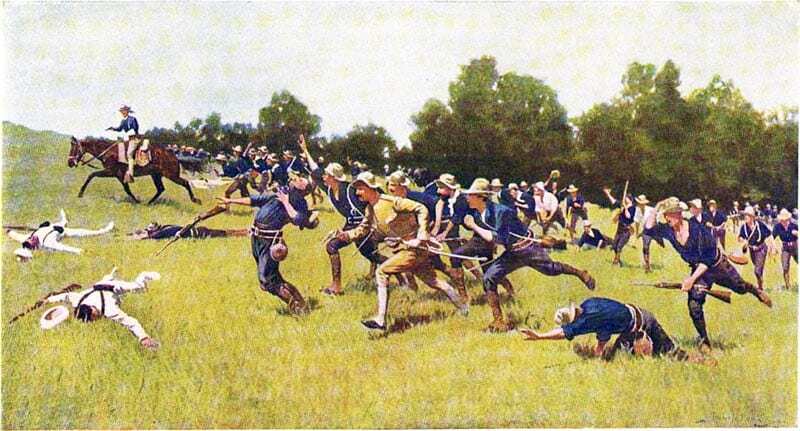 The battle, properly called the battle of the Santiago Heights, began when Spanish troops pinned down Roosevelt’s cavalry at the base of Kettle Hill, one of two peaks making up the San Juan Heights. With the advantage of high ground, the Spaniards were firing down at the cavalry and accompanying U.S. infantry soldiers. 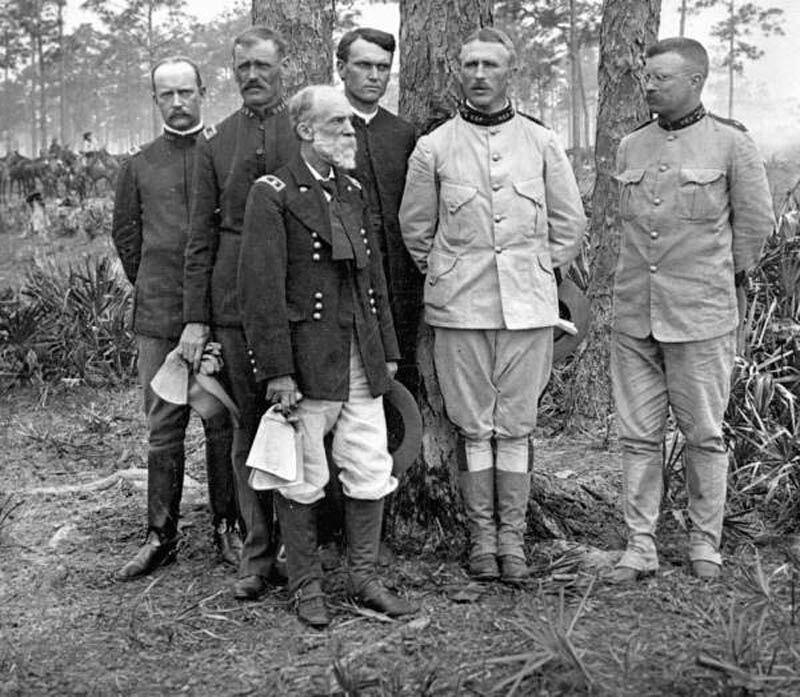 With men being killed and wounded around him – and grazed by a Spanish bullet – Roosevelt must have decided there was no choice about what to do next. Roosevelt led his regiment of volunteers up Kettle Hill alongside Army regulars. “At the base of the San Juan, or first hill, there was a strong wire fence or entanglement in which the line hesitated under grueling fire and where the losses were severe. [Roosevelt] jumped through the fence, and by his enthusiasm, his example and courage, succeeded in leading to the crest of the hill a line sufficiently strong to capture it. Roosevelt’s supporters say he was denied the medal during his lifetime because he was critical of the Secretary of the Army. But some historians argue that Roosevelt, and those who admired him, exaggerated his role. No one disputes that Roosevelt is credited with charging the wrong hill: San Juan Hill was the next peak over from Kettle Hill, where he actually fought. Roosevelt became vice president in 1901. He assumed the presidency later that year when President William McKinley was assassinated. At 43, he was the youngest president in the nation’s history. In 1906, he was awarded the Nobel Peace Prize for his role in negotiating a settlement of the Russo-Japanese War of 1904-05. He remained president until 1909. Roosevelt is the only president ever to be awarded the Medal of Honor. Roosevelt is the only president ever to be awarded the Medal of Honor. His son, Brig. Gen. Theodore Roosevelt, received the medal for being the first general ashore during the Normandy landings on D-Day in 1944. The only other father and son to receive Medals of Honor were Gen. Douglas MacArthur and his father Gen. Arthur MacArthur, who won the medals respectively in World War II and the Civil War. Leaving the presidency in 1909, Roosevelt soon jumped back into politics. In 1912, he ran for president on the Progressive ticket. While campaigning in Milwaukee, he was shot in the chest by a fanatic. Roosevelt soon recovered but was never elected again. He died in 1919. This is a great article, wonderful old photos, and a Remington portrait too. I didn’t know he was there as a correspondent. Frederic Remington went to Cuba before the war started to cover the ongoing revolution for the Hearst papers. In a much reported, but never verified story he wrote to Hearst and asked to be recalled, to which Hearst responded, “You furnish the pictures, I’ll furnish the war.” When the USS Maine was sunk, he returned to cover Teddy Roosevelt’s Rough Riders and was present at the battle.